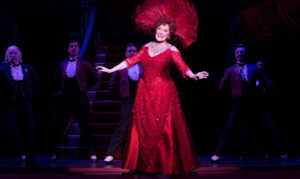 A graceful, thankful Dolly (Betty Buckley) takes in the loving atmosphere at the Harmonia Gardens Restaurant in the national equity tour of the most recent Tony-Award-winning Broadway revival of Hello, Dolly! MIAMI — The woman of the moment rises. 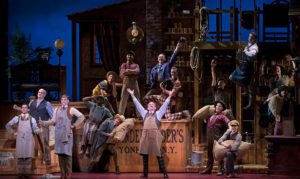 Horace Vandergelder (Lewis J. Stadlen) is at the center of an upbeat scene in his hay and feed store in Yonkers.